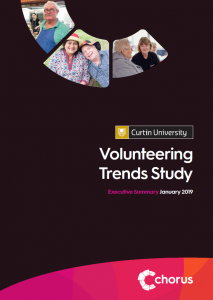 To find out more about volunteering and the volunteering opportunities available through Chorus email volunteering@chorus.org.au or call 1800 264 268. Most volunteers are looking to do something worthwhile, improve their resume, contribute to something meaningful in their community or improve their social circle. Groups find volunteering a great way to build their team, help their community and learn new skills. People can keep physically and mentally healthy through volunteering. Research shows social interaction, a team environment and acts of kindness can benefit the ‘giver’ immensely, triggering ‘feel good’ emotions and positive states of mind and mental health. Many volunteers go on to find work or continue to volunteer past their ‘need to’ date. This is because the volunteer opportunity brings ‘feel good’ rewards along with social opportunities and events. Gardening volunteers operate from our five depots around Perth – Carlisle, North Perth, Wanneroo, Safety Bay, and Midland – from 8am to approximately 3pm. Gardening volunteers are asked to wear closed in boots/shoes/trainers with comfortable shorts or trousers that they are happy to get dirty. Branded shirts are provided for regular volunteers. We recommend wearing a hat and sunscreen and bringing a packed lunch and water. Social support volunteers work directly with customers, one-to-one or in a group. Activities include taking a customer shopping, home visits, trips to a place of mutual interest, or supporting a group of customers on an outing or in a program. Social support volunteers use their own vehicle to transport customers and are reimbursed for fuel. If a social support volunteer does not have their own vehicle, they may be able to carry out home visits by using public transport. One of the ways Chorus volunteers support customers is through the Community Visitors Scheme. To find out more about this scheme click here. We make every effort to match volunteers and customers on convenience, location and mutual interest. Social support volunteering requires as little as two hours per fortnight. Volunteering can be a rewarding experience. By befriending an older person, volunteers have a chance to make a positive difference to the customers life – as well as their own. Various administration duties are available within our various office locations and departments. Drivers provide safe, timely, reliable transport to assist customers to access the community. Those who use this service are frail aged and younger people with a disability. Our services support independence. You must have a clean driving record and be physically fit. Training and support is provided. If you have recovered from a mental health condition and wish to help and inspire others to recovery who are currently experiencing the anguish of mental health issues then become a volunteer for the Personal Helpers and Mentors Program. Our healthy meals service, Chorus Kitchen, delivers fresh and healthy meals to those who are unable to make their own. Volunteering opportunities are available for drivers to deliver the meals and in the kitchen preparing and serving the meals to customers using our dining room. Many people keep physically and mentally healthy through volunteering. Research shows social interaction, a team environment and acts of kindness can benefit the ‘giver’ immensely, triggering ‘feel good’ emotions and positive states of mind and mental health. Volunteers are invited to contribute with feedback and suggestions via our bi-annual newsletter and suggestions boxes. Volunteer newsletters are produced twice a year to keep everyone informed of what’s happening. Volunteers are offered reimbursement for travel expenses based on the public transport system. If they carry customers in their own vehicle, they are reimbursed for fuel based on the size of their vehicle engine. Gardening volunteers are offered lunch money to cover the cost of their packed lunch, unless under another arrangement, e.g. a job agency. Volunteer recognition and events are high on the list of priorities at Chorus. Events throughout the year include a breakfast celebration in May as part of National Volunteer Week; a celebration at Government House for International Volunteer Day in December; a Christmas Party at Yokine Bowling Club; Christmas in July BBQs plus other smaller BBQs throughout the year. Volunteers are often nominated for local and community awards. Chorus was the winner of the Staff and Volunteer Training Award from Belmont Business Enterprise Centre in 2010 and the winner of Strengthening Volunteering Community Service Industry Awards in 2009. Becoming a volunteer with Chorus is easy! Simply contact us with the below information and our Volunteer Coordinator will be in touch. For more information, contact us on volunteering@chorus.org.au.